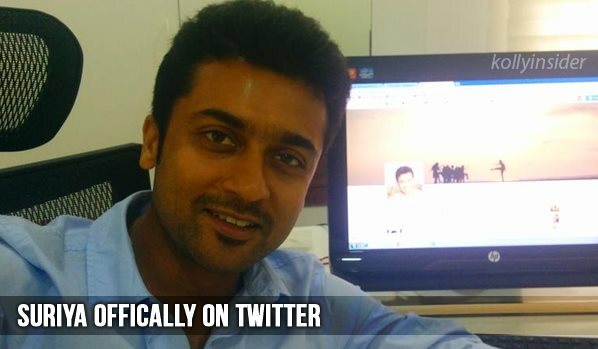 It is a happy news to Suriya's fans as their favourite star has officially joined Twitter today. There were many rumours earlier that he is on twitter and facebook and the actor refused it. He had earlier mentioned that he will announce it when he joins the social networking sites and he is on Twitter now. The actor has posted a video with a wish for Women's Day and also has spelled out his Twitter ID (@Suriya_Offl) and says he chose to join Twitter to stay connected with fans who shower their love on him beyond his expectations. Not just that, he has posted a picture of his Twitter page to re-confirm the correct ID he is using and to avoid any fake accounts. His first Tweet is for his fans and well wishers and he promises to be connected as much as he can. The highlight is the cover picture that is a still from his upcoming movie Haiku, produced by him and directed by Pandiraj. A beautiful still with kids on one side and Suriya lifting one leg as the sun is glittering behind him. Suriya's first cover picture is with the dazzling suriyan. Welcome Suriya. Looking to hear a lot from you. Couldn't sleep last night..! Excited:) Twitter is totally new to me.. It's overwhelming to see the love you all show.. Seriously! Looking frwd for great times ahead.. Love u all! Gud nite everyone!